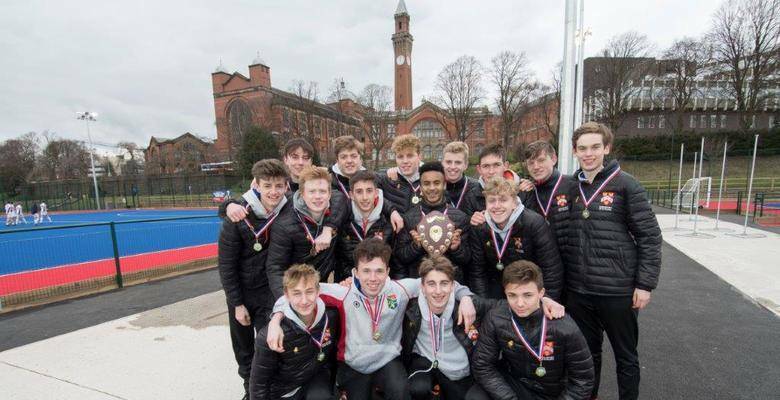 Kingston Grammar School under 19’s boys fought off stiff competition from more than 100 schools nationally to emerge triumphant at the under 19’s inaugural ISHC (Independent Schools Hockey Cup) Tournament which took place at Birmingham University yesterday. Under the captaincy of KGS Upper Sixth student Mike Moran and KGS hockey coaches Lewis Prosser and Steve Hardy, the victorious Kingston Grammar School under 19’s Hockey first XI fought a gladiatorial series of 6 matches to win their place in the final opposite Hurstpierpoint from which they emerged victorious, winning 5-1. Earlier they had beaten Portsmouth Grammar School 4-2 in the semi-finals. Head of Boys Hockey, Steve Hardy, said, “We are so proud of our under 19’s hockey team it was a tough competition and we had to fight very hard to get through the 6 rounds to the final. We would like to congratulate all of our boys who took part especially the upper sixth boys who are leaving with this having been their final Hockey match representing Kingston Grammar School. Respect to all of our opponents who took part.